Sweet-and-Sour Tofu: Our New Guilty Pleasure. Greasy fried sweet-and-sour Chinese dishes have never appealed to me. The closest I get is repeat ordering our beloved sesame tempeh at our local China Delight (though even that was too battered and heavy last time we brought some in). 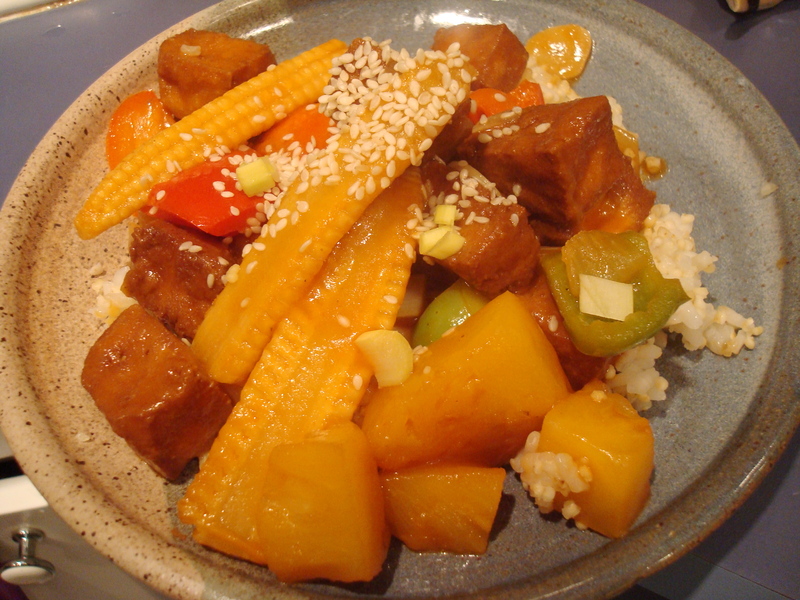 So I don’t know why Ivy Manning’s Sweet-and-Sour Tofu recipe intrigued me. Some perverse fascination with the 50s housewife-type ingredients–ketchup, distilled white vinegar, canned pineapple, ground ginger instead of fresh? But there’s something so fun and addictive about this easy recipe. And Manning’s recipe, with its bell peppers, pineapple juice instead of syrup, and only lightly fried nuggets, is infinitely healthier than take-out, not to mention you won’t have to worry about MSG. We’ve made it twice now. Let’s just say it’s a winner with my husband, known to still have the appetite and tastes of a 10-year-boy. Instead of reconstituting Asian store fried tofu cubes I use more healthful soy-marinated (but still fried) ones from our First Alternative Co-op (10 percent off as today was member day). The sweet-and-sour sauce lacquers but doesn’t inundate the chewy, spongy squares. I”ve been looking for something easy to make with tofu as we are eating less and less meat these days. Chinese restaurants have disappointed me more often than not…so will definitely try this at-home version.